Ryan Fitzpatrick has been great! There’s no denying that fact! The Buccaneers are off to a great start behind the former Harvard star, and the passing game has been a primary reason. It has been reported that receiver Desean Jackson has endorsed the long-time veteran QB, to keep him as the starter. 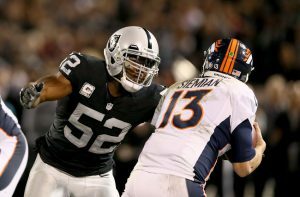 It makes sense coming from Jackson, who has five touchdown passes from Fitzpatrick and only one from Jameis Winston. 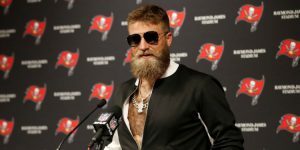 But as much fun as it is watching Fitzpatrick dress up like an inflated Connor McGregor figurine, Jackson and Bucs fans need to pump the brakes on leaving Winston on the bench. “Fitzmagic” is exactly what it sounds like, magic. It’s an illusion. And the idea that this illusion is somehow real, has been responsible for several other teams stunting their growth, while hoping that Fitzpatrick could bring them to the promised land. After he was barely visible in St. Louis and Cincy, he got his shot in Buffalo, and Fitzmagic was born; resulting in four seasons of personal mediocrity and below average team success. In his next two stops as a starter, he was Fitztragic in Tennessee and Fitzbland in Houston. At 33 years old the Fitzmagic appeared again in New York and he posted his best statistical season of his career; 3900 yards, 31 touchdowns, 15 interceptions, and his team went 10-6. The following season he was Fitzgarbage en route to his worse season as a pro; 2700 yards, 12 touchdowns, and 17 interceptions, the second worst total of his career (23 ints in ‘11). So is a five or six game sample size at almost age 36 is supposed to be proof that the Buccaneers should leave their young prodigy on the bench? Really? Since when? Even if you argued that Fitzpatrick was better right now, we have seen that meritocracy doesn’t mean much at the quarterback position. Kaepernick is out of a job, but so many horrible quarterbacks are employed. Josh Allen and Sam Darnold are both starting when their teams decided to trade away AJ McCarron and Teddy Bridgewater, the best options for success on their teams. Tyrod Taylor would have the Browns at 2-0 if it wasn’t for field goal kicking so bad, it made Bucs fans cringe. Instead they are chanting for Baker Mayfield. Eli Manning has been terrible for years and his job has never been in jeopardy until he was justifiably benched last season in favor of Geno Smith. The Giants were destroyed for their correct decision and not only went back to the 37-year old Manning, but doubled down on him in the offseason by not adding any competition at the position, and letting Geno Smith end up with the Chargers. People always bring up the turnovers for WInston as proof that he may not be the answer, but they conveniently forget all of the positives about his game. In his first three seasons, Winston has accounted for more yards (12,149 to 11,814) than Fitzpatrick in his best three seasons. They both complete passes at just above 60% but while Fitzpatrick has more touchdowns (82 to Winston’s 77 total TDs), Winston’s 44 interceptions in his first three years is 10 shy of Fitzpatrick’s best seasons. All of this, and most are willing to admit that Winston has superior arm talent, mobility, and is almost 11 years younger. The reason that most media members are onboard with benching Winston has nothing to do with his on-field performance, and everything to do with questionable decisions that the quarterback made off the field dating back to college. Many have not, and never will, forgiven him for his bad judgements. 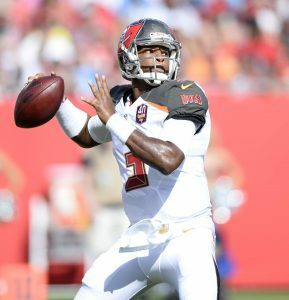 This disdain for Winston as a person has skewed their views of him as a quarterback talent, which has led these people to believe that the Buccaneers would be better off cutting ties with him. Hopefully the Tampa Bay braintrust is smarter than making a business decision based off emotion. The idea that you should not play your most talented players because you have a personal issue with the player is not conducive to winning. 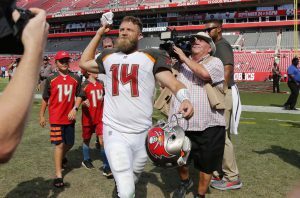 I am sure the other teams in the NFC, and especially the East, would love to see Fitzpatrick continue in this role because they know that eventually he will regress to the normal Fitz. Fitzmagic is just like any other illusion. It is fun to watch for a short amount of time, but at some point you realize that it is not real and you are ready to go home. Winston is almost home Tampa Bay. Don’t stay away too long or you may find yourself trying to find a new home.